My arepa was overflowing, but I had to scoop up every bite. The filled-and-toasted corn pancakes at Cilantro & Ajo, a new South Side street-food joint, were just too good. Cilantro & Ajo (cilantro and garlic) opened in the sea of South Side bars in September, as a counter-service eatery serving up Venezuelan street food. Venezuelan cuisine, like most Latin American cooking, is based on corn, yucca (a starch similar to a potato), beans, rice, and plantains. At any Venezuelan restaurant, arepas are front-page items. On a traffic-ridden Tuesday night, I made my way to the South Side. Cilantro & Ajo was easy to spot, the large front window spilling light onto the sidewalk. Next to its gray neighbors, the restaurant stuck out with a bright orange exterior. Cilantro & Ajo followed a build-it-yourself model for arepas. I took the server’s advice and chose one of the restaurant’s traditional offerings, pabellon, the corn bun filled with black beans, plantains, shredded beef, and queso fresco. To pair with the arepa, I ordered a sweet plantain and cheese empanada, yucca fries, quesillo (Venezuelan flan), and brown lemonade. Within two minutes, my lemonade, flan, and arepa were in front of me. I sat at one of the many small, circular tables to eat, bouncing my feet to the boisterous music blasting from speakers. It was worth the mess. All of the elements worked together, especially the addition of queso fresco and plantain. The shredded beef was juicy in the style of pulled pork. Unlike other Latin American cuisines, the plantain wasn’t caramelized with sugar. The slight sweetness from the fruit balanced the tang from the restaurant’s namesake cilantro and garlic sauce. The brown lemonade, made with limes instead of lemons, tasted like Arnold Palmer. The citrus barely appeared at the end of each sip. It wasn’t cloying or juice-like thanks to the use of sugar cane, a mild, brighter, vanilla flavor. When I was halfway done attacking my arepa, the empanada and crispy yucca arrived. The empanada was simple, just cheese and plantain. 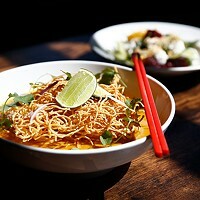 It was the perfect street food, a five-bite, self-supported meal. I wasn’t completely sold on the combination but doused it in cilantro and garlic sauce to add a little zest. For years, I have been plagued with a serious love affair with fries, especially yucca fries. These thick slices of yucca were crunchy on the outside but stayed soft on the inside. The yucca outperformed the city’s best French fries. Cilantro & Ajo smothered the starch in garlic sauce and crumbled cheese. The fries were heavenly. I finished with the quesillo, a beautiful ombre of color from the custard’s caramelization. It was smooth, not too sugary, swimming in syrup, and melted in my mouth. After a few sweet bites, I was happily full. 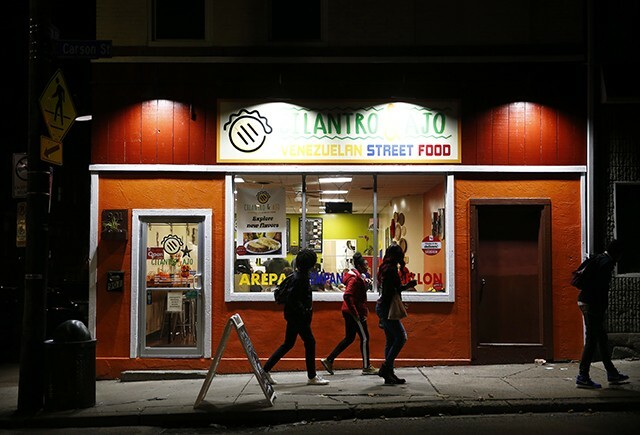 Cilantro & Ajo gives Pittsburgh a peek into the heart of Venezuelan street food. Ditch the pub grub for these two-bite pockets of flavor. 1. My own bottle of sauce. When the server walked out with my tray of food, one thing stood out. A bottle of sauce. My own bottle of cilantro and garlic heaven. I reached for the bottle again and again, sending silent “thank you” messages to sauce gods. Unfortunately, I didn’t make it to Cilantro & Ajo on a Sunday. But, to celebrate the “day of rest,” the restaurant features a traditional Venezuelan dish. Follow them on social media to stay updated on the week’s special. 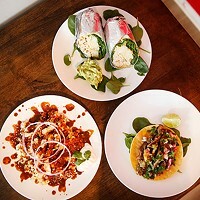 Cilantro & Ajo's menu is deep, but thankfully not overwhelming. The options are appealingly endless. There are items that I didn’t get to touch like patacones and chachapas. I’ll just have to keep going back until I’ve tasted everything on the menu.